An artist's rendering of Quaoar, also named 2002 LM60. A large planet-like object out in the realm of Pluto shows signs of either a relatively recent collision or perhaps volcanic activity, astronomers said today. If proven out, it would be the first known volcano on an object other than a planet or moon. Earth and Mars both have volcanoes, and Jupiter's moon Io is a riot of volcanic activity. 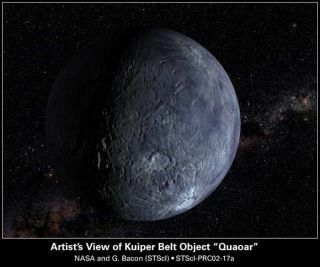 Quaoar, as it is known, resides in the Kuiper Belt, a region of icy objects beyond Neptune's orbit. Astronomers expect most Kuiper Belt Objects (KBOs) to be relatively pristine leftovers from the formation of the solar system. They are the comets that have not yet made a close pass around, the wannabe planets that never grew quite big enough. Quaoar (pronounced kwa-whar) is roughly 783 miles (1,260 kilometers) wide, second only in size among KBOs to Pluto, with a diameter of 1,490 miles (2,400 kilometers). KBOs are thought to be composed of rock, water ice and various other frozen chemicals. Hundreds have been found, but most are too far away and too small to study in detail. Water ice has been detected on a few. The new study, led by David Jewitt of the University of Hawaii's Institute for Astronomy, is reported in the Dec. 9 issue of the journal Nature. Jewitt and a colleague found signs of ammonia hydrate and crystalline water ice on the surface of Quaoar. Both substances should be destroyed over a few million years by particle irradiation, they say. That's a short period of time considering the solar system's entire life of 4.6 billion years. "We conclude that Quaoar has been recently resurfaced, either by impact exposure of previously buried ices or by cryovolcanic outgassing, or by a combination of these processes," the scientists conclude. The conclusion is not firm, but intriguing nonetheless. Being so far from the Sun, KBOs should not be warm enough to form crystalline ice without some sort of unusual circumstance. Water ice incorporated into an object at low temperatures ought to be amorphous, rather than having the "highly coordinated architecture of a crystal lattice," explains Caltech scientist David Stevenson. Based on lab work, scientists think water must be heated to about minus 279.7 Fahrenheit (100 Kelvin) in order to form crystalline ice. The frigid space of the Kuiper Belt, billions of miles from the Sun, is even colder than that. "The presence of crystalline ice is surprising," said Stevenson, who was not involved in the new study but wrote a review of it for the journal. "The precise temperature required, however, is not known and may not be the same in laboratory experiments as it is in space," Stevenson cautions. "Yet it might be that we are seeing evidence for 'planetary' processes such as volcanism within these bodies." The crystalline ice was confirmed recently in separate research done by the discoverers of Quaoar, Stevenson said. The claim of ammonia hydrate is less convincing, Stevenson writes, but he notes that based on theory, Quaoar ought to have some ammonia inside. He said a mixture of ice and ammonia deep in the interior would be less dense than the rest of the object. "It could percolate upwards and perhaps segregate to form a fluid-filled crack," which might propagate to the surface, or near to it," he said. "All of these processes are directly analogous to basaltic volcanism on Earth and other terrestrial planets." Stevenson stresses that this scenario is speculative, and that more observations are needed.